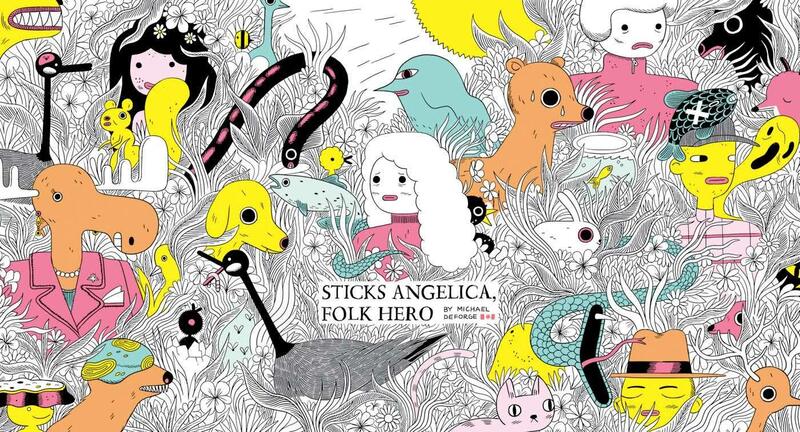 I was a few pages into Michael Deforge's comic Sticks Angelica, Folk Hero before I was confident that it was meant to be funny. That might sound like an attack on his writing or comedy, but it's not meant as such. It is, however, meant to convey how wry and idiosyncratic it is. It's also sometimes witty, sometimes silly. There's a species of snake in the book called a Harmless Snake but they are deadly poisonous and have given themselves the name as a "form of camouflage". If you don't "get" the humour right away, if you're like me, it will quickly grow on you. Most of the book is told in page length strips but nonetheless, characters become well-defined. They're flawed characters but I came to appreciate them. The art matches the style in quirk and is coloured in black, white, and pink.